The invention relates to a novel process for producing a supported metallocene catalyst system useful for the polymerization and/or copolymerization of olefins, alpha-olefins, and/or diolefins which results in a catalyst product which during polymerization, produces minimal to no reactor fouling and polymer of controlled morphology. The invention is particularly useful for but not limited to polymerizing propylene or copolymerizing propylene with olefins having two or more carbon atoms. The novel support technique described herein results in a catalyst which will obtain polymer product having controlled, uniform particle size, narrow molecular weight distribution, high bulk density and depending upon the metallocene employed and monomers polymerized, stereoregularity. The invention relates to method for preparing a metallocene catalyst system for the polymerization of olefins, and more particularly to a process to support metallocene catalysts on inert mediums. Homogeneous or non-supported metallocene and organoaluminum catalyst systems are known and exploited for their high catalytic activity when employed in olefin polymerization and for their ability to produce polymers with terminal unsaturation. However, these homogeneous catalyst systems suffer from the limiting disadvantage of producing polymer which sticks to the reactor walls during the polymerization process or polymer having small particle size and low bulk density which limit their commercial utility. Typically, polymer particle size and bulk density are determined by the morphological properties of the catalyst solid component [i.e. an inert carrier or supported media]. Absent a solid component in the polymerization media, inferior particle size of the final polymer product results. Obtaining a useful supported catalyst for metallocene/alumoxane systems has been a problem in the past. Likewise, maintaining commercially acceptable levels of catalyst activity with minimal levels of reactor fouling occurring during polymerization, is also a problem. Methods known in the art to obtain polymer product having uniform, compact spherical particles, narrow particle size distribution and/or high bulk density, include: (1) preactivating or precontacting the metallocene and organoaluminum (EPA 302,424, EPA 354,893); (2) prepolymerizing a heterogeneous catalyst system in the presence of at least one olefin (EPA 426,646, US 4,871,705); (3) utilizing finally divided alumoxane to yield a powdery polymer (EPA 279,586); (4) utilizing a supported catalyst system and fillers in the catalyst system with affinities for polyolefins (EPA 314,797); and (5) prepolymerizing a supported metallocene catalyst to increase particle size (EPA 347,128). Although meeting their objective, these techniques suffer due to either unacceptable levels of reactor fouling which occur during polymerization, low catalyst activity or producing a polymer having too small particles or broad molecular weight. Various techniques for making supported catalyst systems known in the art include the following preparations of supported metallocene catalyst systems (EPA 518,092, WO 87-03889, and WO 91/09812). Chang describes various methods for preparing heterogeneous catalyst using hydrated carriers or a wet monomer (EPA 367,503, EPA 336,593, US 4,192,075). Chang's hydrated carrier techniques to produce a supported catalyst are limited by the amount of water added to the carrier, since that determines the amount of methylalumoxane (MAO) which can be placed on the support. The activity is acceptable for the polymerization of ethylene, but not for the polymerization of propylene monomers. Meanwhile, Japanese Kokai number SHO 61  - 108,610, discloses dehydration of the support in preparation of the heterogeneous catalyst, by baking the carrier at a temperature of about 500° - 800°C. It is disclosed that if the temperature rises above 800°C, sintering is induced which leads to destruction of micropores. Kaminaka et al. (Polymer, 1992, vol. 33, number 5, 1105) discloses 6 kinds of heterogeneous catalyst prepared on alumina, magnesium or silica support medium and states that the silica supported catalyst of iPr(Flu)(Cp)ZrCl2 were found to be inactive for polymerization of propene monomer. In US 4,659,658 Coleman et al., describe a combination of supported titanium compounds wherein one titanium component, is supported on a magnesium dichloride carrier while the other, a metallocene component, is supported on alumina. Welborn describes in US 4,808,561 and US 4,701,432 techniques to form a supported catalyst where the inert carrier, typically silica, is calcined, and contacted with a metallocene(s) and an activator/cocatalyst component. The metallocene and activator may be contacted simultaneously or in sequence and deposited onto the carrier to achieve the hetereogeneous system. US 4,808,561 discloses that the order of addition of metallocene and cocatalyst onto the support material can vary and is unimportant in achieving a catalytically active, supported catalyst system. The preferred embodiment section of US 4,808,561, however, discloses that optimum results are obtained when the alumoxane is dissolved in a suitable inert hydrocarbon solvent which is first added to the dehydrated support material and, slurried in the same or other suitable hydrocarbon liquid. The metallocene is added to the slurry thereafter. The prior art methods described above for producing supported catalysts systems have concentrated on (1) varying treatments of the support or carrier or (2) varying the manner of addition of the catalyst onto the support. Although little has been written regarding commercially marketable catalyst, those skilled in the art are aware that stability, storage and use, and transportation of a supported catalyst are major concerns with regard to a commercially marketable catalyst. Vendors prefer catalysts with catalytic stability of about 6 months or more. Few if any catalyst systems are known which when placed on a support address these commercial needs. The art, as yet, lacks a method to address these problems raised by the prior art techniques for supporting and maintaining a catalyst with high activity, and stability, and yet reduce fouling to commercially acceptable levels during the polymerization reactor process. The present invention relates to a novel process for producing a supported metallocene catalyst system having high catalytic activity, low reactor fouling and stability for periods of at least 6-12 months or more, when stored under inert atmospheric conditions. The heterogeneous catalyst is useful for the production of polyolefins having controlled particle size and narrow molecular weight distribution. The polyolefin produced from these catalysts can be obtained as free flowing polymer and in granular or in powder form. Generally, a granular polymer is obtained when the supported catalyst (un-or pre-polymerized) is employed with TEAL as cocatalyst, a powdery polymer is obtained when the supported catalyst (unprepolymerized) is employed with MAO. There are minimal or no signs of reactor fouling observed during polymerization when the inventive process to produce the supported catalyst is followed and thus has significant commercial utility. The general process described hereinbelow to prepare a supported catalyst can be applied to any single or mixed metallocene system. Typically the metallocene is activated with MAO to form a reaction product which is subsequently contacted with dehydrated silica, and supported on the silica through drying. This forms the supported catalyst product. It is important that the supported catalyst product be thoroughly dried before subsequent use. The catalyst product may optionally be prepolymerized with an olefin to impart improved catalyst particle strength. During the polymerization process, a trialkylaluminum or organoaluminum co-catalyst or scavenger is employed to minimize or eliminate reactor fouling and increase catalytic activity. Depending upon polymerization temperatures, one chooses a trialkyl versus an organoaluminum co-catalyst in the process. The supported catalyst produced by the novel process has been found to maintain catalyst activity in the range of about 50% to 90% for greater than one year. The catalyst can be employed in the polymerization of one or more olefins or alpha olefins containing from about 2 to about 20 carbon atoms, to produce homo- and/or co-polymers, but is especially useful in the production of iso- or syndiotactic polypropylene, ethylene-propylene copolymer, and polyethylene and ethylene higher alpha olefin copolymers. As used herein, the terms "support" and "carrier" are interchangable. Metallocene is defined as a derivative of a cyclopentadienylide (Cp), which is a metal derivative containing at least one cyclopentadienyl moiety and a transition metal. The transition metal is selected from Groups 4, 5 and 6 metals, preferably 4 and 5 metals, preferably titanium, zirconium, hafnium, chromium or vanadium; most preferable Zr, Hf and Ti. The Periodic Table of Elements refered to herein is that according to the Table published in Hawley's Condensed Chemical Dictionary, 11th Edition, 1987. The catalyst system to be placed on a support may also contain both Cp and non-Cp transition metal groups. The invention relates to a novel process for producing a supported metallocene catalyst system useful for the polymerization and/or copolymerization of olefins, alpha-olefins, and/or di olefins which results in a catalyst product which during polymerization, produces minimal to no reactor fouling and polymer of controlled morphology. The invention is particularly useful, but not limited, for polymerizing propylene or copolymerizing propylene with olefins having two or more carbon atoms. The novel support technique described herein results in a catalyst which will obtain polymer product having controlled, uniform particle size, narrow molecular weight distribution, high bulk density and depending upon the metallocene employed and monomers polymerized, stereoregularity. The instant invention involves a unique combination of steps, i.e., (1) forming the metallocene/alumoxane reaction solution, (2) adding dehydrated carrier (3) evaporating or heating the resulting slurry to remove liquid solvent (4) further heat to desolvate the solid supported catalyst and thus remove any residual solvent trapped in the pores prior to use. A fifth (5) optional step involves prepolymerizing the catalyst with olefinic monomer, preferably alpha olefins containing from 2 to 20 carbon atoms. To obtain a polymer product in the absence of reactor fouling, the supported catalyst (as is or prepolymerized) is utilized with a cocatalyst or scavenger aluminum alkyl or organoaluminum during polymerization. The additional steps to ensure loss of all moisture and solvent are important for production of the supported catalyst. The transition metal containing catalyst of the present invention is obtained by reacting, in a suitable solvent such as toluene, an organoaluminum compound, typically methyl alumoxane, and a metallocene to form a reaction product solution, which is then contacted with the dehydrated support material. The supported reaction product is isolated, and dried to remove residual solvent. The supported catalyst product formed can be employed as a sole catalyst component for the polymerization of olefins containing from 2 to 20 carbon atoms, or, in the preferred alternative, it can be employed with an organometallic cocatalyst such as triethylaluminum or MAO. It is preferred to employ a cocatalyst or scavenger during polymerization since enhanced catalyst activity and reduced reactor fouling is observed. Typically the support can be any organic or inorganic, porous inert solid, particularly supports such as talc, inorganic oxides, and resinous support materials such as polyolefin. Suitable inorganic oxide materials which are desirably employed include Groups 2, 13, 14 or 15 metal oxides such as silica, alumina, silica-alumina, and mixtures thereof. Other inorganic oxides that may be employed either alone or in combination with the silica, alumina or silica-alumina are magnesia, titania, zirconia. Other suitable support materials can be employed such as, finely divided polyolefins, such as polyethylene. It is important to the instant invention that prior to use, the carrier be thoroughly dehydrated, preferably to show less than 1 wt.-% loss on ignition (LOI). Thermal dehydration treatment may be carried out in vacuum or while purging with a dry inert gas such as nitrogen at a temperature of 100°C to 1000°C, and preferably, from 300°C to 800°C. Pressure considerations are not critical. The duration of thermal treatment can be from 1 to 24 hours preferably 1-8 hours. However, shorter or longer times can be employed provided equilibrium is established with the surface hydroxyl groups. Dehydration can also be accomplished by subjecting the carrier to a chemical treatment in order to remove water and reduce the concentration of surface hydroxyl groups. Chemical treatment converts all water and hydroxyl groups in the oxide surface to inert species. Useful chemical agents are for example, chlorosilanes such as SiCl4, trimethylchlorosilane, dimethylaminotrimethylsilane. The chemical dehydration is accomplished by slurrying the inorganic particulate material such as, for example silica, in an inert low boiling hydrocarbon, such as for example, hexane. During the chemical dehydration treatment, the silica should be maintained in a moisture and oxygen free atmosphere. To the silica slurry is then added a low boiling inert hydrocarbon solution of the chemical dehydrating agent, such as, for example dichlorodimethylsilane. The solution is added slowly to the slurry. The temperature ranges during chemical dehydration reaction can be from 25°C to 120°C, however, higher and lower temperatures can be employed. Preferably, the temperature will be 50°C to 70°C. The chemical dehydration procedure should be allowed to proceed until all the moisture is removed from the particulate support material as indicated by cessation of gas evolution. Normally, the chemical dehydration reaction will be allowed to proceed from 30 minutes to 16 hours, preferably, 1 to 5 hours. Upon completion of the chemical dehydration, the solid particulate material is filtered under a nitrogen atmosphere and washed one or more times with a dry, oxygen free inert solvent. The wash solvents as well as the diluents employed to form the slurry and the solution of chemical dehydrating agent, can be any suitable inert hydrocarbon. Illustrative of such hydrocarbons are heptane, hexane, toluene, isopentane. The specific particle size of the support or inorganic oxide, surface area, pore volume, and number of hydroxyl groups is not critical to its utility in the practice of this invention. However, such characteristics determine the amount of support to be employed in preparing the catalyst compositions, as well as affecting the properties of polymers formed. The characteristics of the carrier or support must therefore be taken into consideration in choosing the same for use in the particular invention. The normally hydrocarbon soluble metallocenes and linear or cyclic alumoxanes are converted to a heterogeneous supported catalyst by depositing the reaction product of metallocene and alumoxane on the thermally or chemically dehydrated supported material. The contacting of the metallocene and alumoxane to form a reaction product and the subsequent contacting with the support material, is conducted in an inert solvent. The same inert solvent or a different solvent is also employed to dissolve the metallocene(s) and alumoxane. Preferred solvents include mineral oils and the various hydrocarbons which are liquid at reaction temperatures and in which the individual ingredients are soluble. Illustrative examples of useful solvents include the alkanes such as pentane, isopentane, hexane, heptane, octane, and nonane; cycloalkanes such as cyclopentane and cyclohexane; and aromatics such as benzene, toluene, ethylbenzene and diethylbenzene. The amount of alumoxane and metallocene usefully employed in preparation of the supported catalyst system can vary over a wide range. However, an aluminum to transition metal molar ratio of about 12:1 to 500:1 is preferred; more preferably, a ratio of 50:1 to 400:1 is employed. The weight ratio of metallocene to support is 0.01 to 0.20, most preferably 0.05 to 0.10. The metallocene(s) and alumoxane are dissolved in toluene to form a reaction product in solution. The amount of solvent to be employed is not critical. Never the less, the amount should be employed so as to dissolve the reaction product, provide adequate heat transfer away from the catalyst components during the reaction and to permit good mixing. Preferably the metallocene solution is added to the alumoxane solution and reacted at room temperature. The reaction between the alumoxane and the metallocene is rapid and it is desired that they are contacted for one minute to one hour, preferably ten minutes. The reaction of the alumoxane and the metallocene is evidenced by its exothermic nature and a color change. However, the exotherm or color changes are not required and other analytical techniques may be employed to monitor completion of the reaction. The supported catalyst of this invention is prepared by adding the previously dehydrated carrier, typically silica, in dry form or as a slurry in the same or a different inert solvent to the previously formed reaction product solution. Preferably the silica is added dry. The ingredients can be added to the reaction vessel rapidly or slowly. The temperature maintained during contact of the metallocene/alumoxane solution and carrier can vary widely, such as, for example, from 0°C to 100°C. Greater or less temperatures can also be employed. The contacting of the silica with the reaction product solution forms a slurry and is preferably maintained at room temperature for one minute to one hour, preferably five minutes. The formed slurry is then heated under vacuum, preferably with a nitrogen flow to aid in removal of the solvent. Heating can be maintained until all the liquid solvent has been removed, typically one to three hours at a temperature from 30°C to 60°C. When all the liquid solvent has been removed, and the solid is visually dry, the isolated solid is additionally heated from 30°C to 80°C for a time of one hour to eight hours, preferably, three hours, or until all of the residual solvent trapped in the porous support material has been removed. At this point the supported catalyst is formed as a free flowing powder. Prior art techniques describe "drying" a supported catalyst system. The present invention differs from the art, regarding the drying step, by specifying removal of residual solvent from the pores of the carrier. There is no teaching or suggestion from references found in the art that this level of dryness would lead to any unexpected results. No reference, alone or collectively suggests that a further degree of dryness, i.e., beyond "visually dry", or beyond a "free flowing" catalyst system would result in any advantages or in a system leading to little or no fouling during polymerization therewith. The inventors have unexpectedly discovered that drying a catalyst system beyond the visually dry stage would result in a system producing little to no reactor fouling. At all times, the individual ingredients as well as the recovered catalyst component are protected from oxygen and moisture. Therefore, the reactions must be performed in an oxygen and moisture free atmosphere and recovered in an atmosphere which is moisture and oxygen free. Preferably, therefore the reactions are performed in the presence of an inert dry gas such as, for example nitrogen. The recovered catalyst is maintained in a nitrogen atmosphere. The supported catalyst can be utilized at this stage for the polymerization of olefins, in combination with a cocatalyst or scavenger. Table 2 illustrates results of syndiotactic polypropylene made using the supported, as-is or un-prepolymerized, i-Pr (fluorenyl) (cyclopentadienyl) zirconium dichloride/MAO catalyst system in combination with either triethylaluminum (TEAL) or MAO as a cocatalyst during polymerization. When TEAL is used at polymerization temperatures of 40°C or greater, a granular polymer product results with minimal to no reactor fouling being observed. When MAO is used at a polymerization temperature of 40°C, a polymer with both granular and powder like characteristics results. Although polymerizations of olefins are exemplified at temperatures of 40°C and 60°C, any temperatures can be employed. MAO as a cocatalyst is recommended for use at polymerization temperatures of 40°C or less, otherwise reactor fouling may be observed. Comparative examples A and B found in Table 2, employed the above catalyst in homogeneous (unsupported) format, resulting in sheets forming on the reactor walls during polymerization at temperatures of 40°C and 60°C. Prepolymerization of the supported catalyst can be employed to strengthen catalyst particles and enhance particle size control of the final polymer formed. The supported catalyst is reslurried in isopentane or a MAO non-solvent and prepolymerized with an olefin monomer, such as ethylene gas. The prepolymerized catalyst is then decanted, washed with isopentane, and dried in a vacuum at room temperature in order to isolate the supported, prepolymerized catalyst. The prepolymerization typically occurs at a temperature of -15°C to +30°C, preferably less than 25°C for 75 minutes. The amount of prepolymer can be varied from 10% to 300% of the supported catalyst weight, most preferably 50-150%. Examples 1-10, demonstrate the support technique employed for placing a cyclopentadienyl transition metal compound and methylalumoxane catalyst system on a support medium. Polymerization experiments were conducted with propylene, ethylene or mixtures of ethylene-propylene monomers. Table 1 relates to polypropylene made using prepolymerized catalysts. 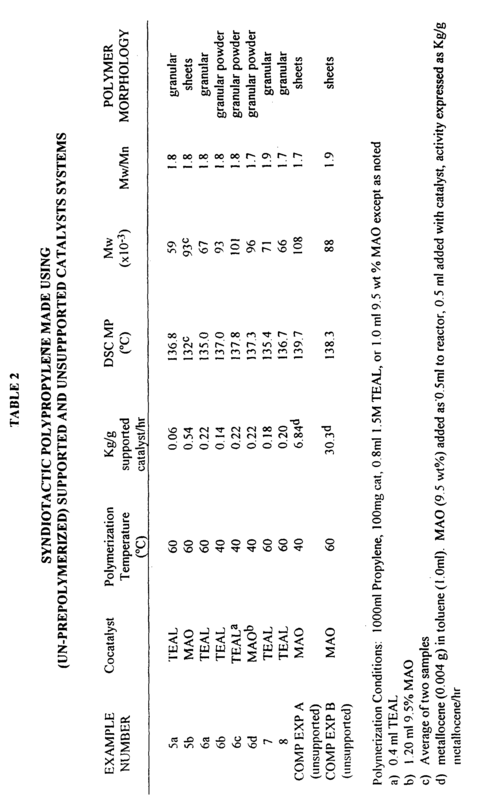 Table 2 relates to syndiotactic polypropylene made using unprepolymerized supported and unsupported catalyst systems. Table 3 relates to particle size distribution of polymers made from the catalyst systems exemplified in examples 1, 2, 3, 4, 9 and 10. Table 1 demonstrates the use of various supported prepolymerized catalyst systems made in accordance with examples 1-4. Table 1 also demonstrates the catalytic activity and physical properties of the polymer product formed. The catalyst activity for prepolymerized catalyst systems shown in Table 1 ranges from 0.11-1.16 kg polymer/grams catalyst/hour. This activity is greater than that observed for the unprepolymerized supported catalyst system employed in examples 5-8 and shown on Table 2. The catalyst activity observed for the unprepolymerized supported catalyst of examples 5-8 ranges from 0.06-0.54 kg polymer/grams catalyst/hour. The teachings of Kaminaka et. al. discussed above are in direct contrast and teach away from the present invention. Applicant's Examples 5-8 demonstrate the support technique for the fluorenyl derivative catalyst disclosed by Kaminaka et. al. and found to be inactive. The fluorenyl derivative catalyst ability to polymerize propylene is exemplified in table 2. The Kaminaka paper illustrates the novelty and nonobvious nature of the present invention. Table 3 demonstrates the particle size distribution and the commercial value for polymers made using catalysts supported by the present invention. Generally, commercial reactors require control of the polymer particle size for good operability. Difficulties are encountered with fines where the particle size of the polymers are less than about 125 µm. 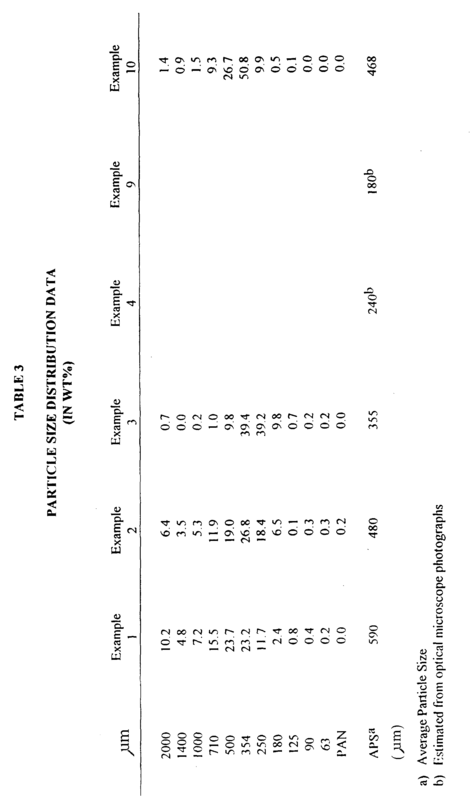 From table 3, it is seen that the majority of the polymers obtained have particle sizes greater than 125 µm. The majority of the polymers were found to have a particle size in the range of 250 - 350 µm. These polymers are commercially interesting due, in part, to the low to no fines generated during polymerization. Fines which lead to reactor fouling, sheeting, and plugged lines and screens in a polymerization reactor. An additional advantage of the particle size of these polymers are their ease of storing and transporting. The present invention describes a support technique which led to the unexpected result of higher catalyst activity with little to no fouling being observed in the reactor during polymerization. Typical catalyst support procedures are directed to supporting a particular type of catalyst; for example, supporting catalysts for polyethylene or EPC production as in Welborn (US 4,808,561) or Hoel (US 4,871,705) respectively. Examples 1-8 of the present invention employ the inventive process for making a catalyst system for producing iso- and syndiotactic polypropylene, example 9 employs a catalyst for producing polyethylene and example 10 employs a catalyst for producing ethylene propylene copolymer. These examples illustrate that the inventive process is a universal method for making and using supported catalyst systems. Comparative experiments were conducted in order to evaluate and compare catalyst, catalyst activity, and polymer production versus that produced in accordance with US 4,871,705, issued to Hoel. These comparative studies are evidenced in Tables 4-7. Table 4 relates to catalyst efficiency employing polymerization temperatures of 33°C for 30 minutes and approximately 335 psi (22.795 atm) ethylene pressure. Table 5 also relates to catalyst efficiency, but employing polymerization temperatures of 40°C and ethylene pressures of approximately 258 psi (17,556 atm). Table 6 relates to polymer data obtained employing a continuous feed polymerization reactor. Table 7 relates to catalyst particle size analysis, comparing catalyst produced in accordance with that taught herein and Hoel, US '705. The general procedure of Example 7 of US '705 (column 13, lines 45 et. seq.) as well as reproducing experimental conditions per Hoel, Table III, Run C8 were repeated employing (i) Davison 948 silica dehydrated at 800°C, (ii) the metallocene designated as "STHI"; (iii) employing both the Hoel and the present inventors' (designated as "TJB" in Tables 4-7) support technique. Table 4 illustrates catalyst activity and polymer molecular weight between the two experimental procedures. Two runs were conducted with TJB's supported catalyst; run (a) led to catalyst with activity too high for the reaction to run 30 minutes, run (b) employed a lesser amount of ethylene monomer than run (a). Table 4 demonstrates that weight percent ethylene incorporation for the polymer is essentially equal between the two procedures, however, molecular weight of the polymer was approximately 1.4X larger when employing catalyst prepared by TJB's procedure. Further, the catalyst according to TJB had approximately 3X greater activity than that catalyst prepared in accordance with Hoel's procedure. Table 5 illustrates catalyst efficiency and shows that even when employing greater amounts of hydrogen to control molecular weight of the product, catalyst activity per TJB's procedure is approximately 2.5X greater than that observed with Hoel's supported catalyst. Polymer molecular weight was likewise greater and the molecular weight distribution of the polymer was narrower when employing TJB's technique. At column 15, line 13 of US '705, Hoel states that when using his support technique on the best comparative zirconocene catalyst both high activity catalyst and high molecular weight polymer were not simultaneously achieved, especially when producing polymers of low ethylene content. Experiments were further conducted in a continuous polymerization reactor which mimics commercial reactors. Table 6 demonstrates high fouling (90 wt.%) produced with the Hoel catalyst. In view of this fouling, the reactor could only run for approximately one hour. The catalyst per TJB's procedure resulted in approximately 61 wt.% fouling and an increase in catalyst activity from 1300 to 2800 g/g catalyst. Due to the decreased fouling and increased catalyst activity observed, the total output of polymer obtained was 4 lbs (1.81 kg) with the Hoel catalyst compared to 293 lbs (132.6 kg) with the TJB catalyst. Table 6 indicates the achievement in the field of supported catalyst techniques because of the usual problems encountered with prior art techniques causing fouling of the reactor. The 33% decreased fouling level observed and demonstrated in Table 6 is of significant value since it indicates reactors can run continuously for longer periods of time before having to shut down due to clogged lines or screens. Table 7 shows measurements on catalyst particle size and indicates that lower fines and a narrower (numerically smaller) particle size distribution index (PSDI) were achieved for the catalyst produced by the TJB technique than that in accordance with the Hoel technique. Both fines and PSDI are important catalyst size parameters to consider in ultimately forming granular polymer products. A narrower PSDI and lower fine value for the catalyst are preferred and considered key to minimizing reactor fouling during polymerization. The technique per TJB produced catalyst product with lower PSDI and fines than the Hoel technique. All examples herein demonstrate the use of a wide variety of metallocenes, bridged and unbridged, and a wide variety of polymer types, such as isotactic PP, syndiotactic PP, polyethylene, and ethylene-propylene copolymers. The advantages of the instant invention, described herein, make this invention extremely valuable. The inventive process provides a means of converting any metallocene into a supported catalyst capable of operating in any polyolefin polymerization reactor with little modification and without operational process related problems. The inventors are not aware of any other known techniques which have exemplified such a wide range of metallocenes for making a wide range of polymer types in a reactor with little to no reactor fouling occurring. Experiments we carried out in nitrogen purged dry boxes. All solvents were purchased from commercial sources, nitrogen purged and dried over activated molecular sieves. ZrCl4 was purchased from commercial sources and used as received. Aluminum alkyls were purchased as 20-25 wt% solutions from commercial sources. The MAO was purchased as 10 or 30 wt % from Shering Company. The silica is Davidson 948 dehydrated to 800°C in a flow of nitrogen for eight hours. All metallocenes were prepared by published literature procedures and characterized by proton and/or carbon NMR. Polymer analysis was carried out as described in US 5,026,798 and US 5,017,714. Tacticity measurements were determined by 13C NMR as described in "Polymer Sequence Distributions", J. C. Randall, Academic Press, New York, (1986). DSC melting points were determined on commercial DSC instruments and are reported as second melting point. Polymerization procedure for the polymerization of propylene monomer employing the supported catalysts of Examples 1-8 is as follows. In a clean, dry two liter autoclave which has been flushed with propylene, the cocatalyst (TEAL or MAO) was added and then the reactor closed and filled with 800 ml liquid propylene. The reactor was heated to the desired temperature and the catalyst, slurried in mineral oil (12 or 18 wt%), was washed in via an addition tube with 200 ml propylene. After the desired reaction time the reactor was cooled and the excess propylene vented. The polymer was removed and dried. The present invention is illustrated by the following illustrative but not limiting examples. Results are tabulated in Tables 1-7. "Me" means methyl, "Ph" means phenyl, and "Pr" means propyl. The supported catalyst prepared in example 9 was employed for the polymerization of ethylene; that prepared in example 10 was employed for the polymerization of ethylene propylene copolymer. To an eight liter vessel equipped with a cooling jacket and an efficient overhead stirrer was added Methyl Aluminoxane (MAO, 904 ml, 30 wt% in toluene, 4.2 mol Al). With stirring a solution of rac-Me2Si(tetrahydroindenyl)2ZrCl2 (20.0 g, 0.0438 mol, Al/Zr = 96) prepared according to US 5,017,714 in toluene (950 ml) was slowly added over five minutes. After stirring two minutes, dehydrated silica (199.8g) was added over three minutes. Stirring was continued for four minutes and then the reaction mixture was gradually heated to 48°C over thirty minutes while vacuum was applied from the top of the vessel. A slight nitrogen purge into the bottom of the vessel assisted in the solvent removal. Ninety minutes later the mixture was very viscous. Heating was increased gradually to 63°C over the next three hours. At this point the supported catalyst is a dry, free flowing solid which was cooled to ambient temperature. Isopentane (6.4 liter) was added to slurry the solids. This slurry was cooled to -5°C and ethylene slowly added via a dip tube at a rate of 2 l/minute. This was gradually increased to 3.6 l/minute over eighty minutes as the temperature rose to 16°C at which time the ethylene flow was stopped. Agitation was stopped, and the prepolymerized catalyst allowed to settle. The liquid phase was decanted and the solids washed twice with isopentane, and transferred to a dry box. The slurry was passed through a sieve (#14), filtered and washed three times with pentane (4 liter). The solids were dried under vacuum at ambient temperature for 3.5 hours to give a light yellow solid (686 g, density = 0.407 g/cc). To an eight liter vessel equipped with a cooling jacket and an efficient overhead stirrer was added Methyl Aluminoxane (MAO, 904 ml, 30 wt% in toluene, 4.2 mol Al). With stirring a solution of Me2Si(tetrahydroindenyl)2ZrCl2 (10.0 g, 0.0219 mol, Al/Zr = 192) in toluene (950 ml) was slowly added. After stirring eight minutes dehydrated silica (200.7g) was added. Stirring was continued for two minutes and then the reaction mixture was gradually heated to 54°C over sixty five minutes while vacuum was applied from the top of the vessel. A slight nitrogen purge into the bottom of the vessel assisted in the solvent removal. At this point the mixture was very viscous. Heating was increased gradually to 66°C over the next three hours. At this point the supported catalyst was a dry, free flowing solid which is cooled to ambient temperature. Pentane (5.1 liter) was added to slurry the solids. This slurry was cooled to -1°C and ethylene slowly added via a dip tube at a rate of 2.1 l/minute, This was gradually increased to 3.6 l/minute over eighty five minutes as the temperature rose to 15°C at which time the ethylene flow was stopped. Agitation was stopped, and the prepolymerized catalyst allowed to settle. The liquid phase was decanted and the solids washed three times with isopentane, and transferred to a dry box. The slurry was passed through a sieve (#14), filtered and washed three times with isopentane (2 liter). The solids were dried under vacuum at ambient temperature for 4.25 hours to give a light yellow solid (457 g, 0.532 g/cc). To an eight liter vessel equipped with a cooling jacket and an efficient overhead stirrer was added Methyl Aluminoxane (MAO, 525 ml, 30 wt% in tolouene, 2.4 mol Al). With stirring a solution of Ph2C(fluorenyl)(cyclopentadienyl)ZrCl2 (7.0 g, 0.0126 mol, Al/Zr = 191, prepared according to EPA 387,690) in toluene (700 ml) was slowly added over five minutes. After stirring eight minutes, dehydrated silica (146.1g) was added over ten minutes. Stirring was continued for seven minutes and then, while vacuum was applied from the top of the vessel, a slight nitrogen purge into the bottom of the vessel assisted in the solvent removal, the reaction mixture was gradually heated to 54°C over fifty minutes and became very viscous. Heating was increased gradually to 64°C over the next three hours. At this point the supported catalyst was a dry, free flowing solid which was cooled to ambient temperature overnight. Isopentane (5.5 liter) was added to slurry the solids. This slurry was cooled to 15°C and ethylene slowly added via a dip tube at a rate of 1.5 l/minute. The addition rate was maintained between 1.0 and 1.5 l/minute over eighty five minutes as the temperature rose to 24°C at which time the ethylene flow was stopped. Agitation was stopped, and the prepolymerized catalyst allowed to settle. The liquid phase was decanted and the solids washed twice with isopentane, and transferred to a dry box. The slurry was passed through a sieve (#14), filtered and washed three times with pentane (2 liter). The solids were dried under vacuum at ambient temperature for 3.5 hours to give a light purple solid (364 g). In a round bottom flask i-Pr(Fluorenyl)(cyclopentadienyl)ZrCl2 (0.025g, 0.058 mmol, made by the procedure of Ewen, et. al. J. Amer. Chem. Soc. 110,6255 (1988)) was slurried in toluene (3.5 ml) and stirred fifteen minutes. To this orange slurry MAO (7.5 mls, 9.5 wt% MAO in toluene) was slowly added to give a deep purple solution. After fifteen minutes, silica (0.5 g) was added and stirring continued twenty minutes. The reaction mixture was heated to 65°C under vacuum for 75 minutes. The dried solid was washed twice with pentane (14 mls total), filtered and dried under high vacuum giving a purple solid (0.76 g). In a round bottom flask i-Pr(Fluorenyl)(cyclopentadienyl)ZrCl2 (0.025 g, 0.058 mmol) was slurried in toluene (3.5 ml) and stirred. To this orange slurry MAO (5.3 mls, 9.5 wt% MAO in toluene) was slowly added to give a deep purple solution. After fifteen minutes silica (0.5 g) was added. After 16 hours the reaction mixture was heated to 45°C under vacuum. After 15 minutes the solids were visually dry. Drying was continued for 1.75 hours. The dried solid was washed twice with pentane (13 mls total), filtered and dried under high vacuum 1.75 hours giving a purple solid (0.60 g). Example 6 was repeated, except the MAO amount was 2.7mls and the isolated yield was 0.54g. Example 6 was repeated except the metallocene solution was added to the MAO solution. The solid was visually dry in 30 minutes and the isolated yield was 0.67 g.
To an eight liter vessel equipped with a cooling jacket and an efficient overhead stirrer was added Methyl Aluminoxane (MAO, 905 ml, 30 wt% in toluene, 4.2 mol Al). With stirring a solution of Me2Si(tetrahydroindenyl)2ZrCl2 (10.0 g, 0.0219 mol, Al/Zr = 192, (prepared according to US 5,017,714)in toluene (700 ml) was slowly added over three minutes. One minute later, dehydrated silica (200 g) was added over three minutes. Stirring was continued for one minute and then the reaction mixture was gradually heated to 52°C over thirty minutes while vacuum was applied from the top of the vessel. A slight nitrogen purge into the bottom of the vessel assisted in the solvent removal. Thirty minutes later the mixture was very viscous. Heating was increased gradually to 66°C over the next three hours. At this point the supported catalyst was a dry, free flowing solid which was cooled to ambient temperature. Isopentane (6.2 liter) was added to slurry the solids. This slurry was cooled to 15°C and ethylene slowly added via a dip tube at a rate of 3.3 l/minute which was maintained over 55 minutes as the temperature rose to 20°C at which time the ethylene flow was stopped. Agitation was stopped, and the prepolymerized catalyst allowed to settle. The liquid phase was decanted and the solids washed three times with isopentane, and transferred to a dry box. The slurry was passed through a sieve (#14), filtered and washed three times with pentane (3 liter). The solids were dried under vacuum at ambient temperature for four hours to give a light yellow solid (551 g, density = 0.442 g/cc). An ethylene polymerization was carried out by placing hexane (400 mls) into a dry, one liter autoclave equipped with an overhead stirrer. TEAL (0.8 ml, 1.5M) was added, and the reactor heated to 60°C. When the temperature stabilized the solid catalyst prepared above (0.345 g) was injected with hexane (100 mls) and ethylene was added continuously to maintain a reactor pressure of 180 psig. After one hour the reactor was depressurized, and the polyethylene/hexane slurry removed. Evaporation of the hexane gave 27.9 g polyethylene granules with bulk density = 0.307 g/cc. To an eight liter vessel equipped with a cooling jacket and an efficient overhead stirrer was added Methyl Aluminoxane (MAO, 2950 ml, 10 wt% in toluene, 4.8 mol Al). With stirring a solution of bisindenylzirconiumdichloride (5.0 g, 0.0123 mol, Al/Zr = 390, prepared according to commonly known literature procedures utilizing indenyl lithium and ZrCl4) in toluene (700 ml) was slowly added over seven minutes. After stirring five minutes dehydrated silica (199.5 g) was added over four minutes. Stirring was continued for two minutes and then the reaction mixture was gradually heated to 58°C over ninety minutes while vacuum was applied from the top of the vessel. A slight nitrogen purge into the bottom of the vessel assisted in the solvent removal. Fifty five minutes later the mixture was very viscous. Heating was increased gradually to 64°C over the next three hours. At this point the supported catalyst is a dry, free flowing solid which is cooled to ambient temperature. Isopentane (6.4 liter) is added to slurry the solids. This slurry was cooled to 6°C and ethylene slowly added via a dip tube at a rate of 5.7 l/minute. This was maintained over fourty minutes as the temperature rose to 24°C. The flow was reduced to 3.3 l/minute for for twenty five minutes at which time the ethylene flow was stopped. Agitation was stopped, and the prepolymerized catalyst allowed to settle. The liquid phase was decanted and the solids washed five times with isopentane, and transferred to a dry box. The slurry was passed through a sieve (#14), filtered and washed three times with pentane (4 liter). The solids were dried under vacuum at ambient temperature for 2.6 hours to give a light yellow solid (772 g). Ethylenepropylene (EP) copolymer was produced by using the method outlined in the experimental section above, except that hydrogen (0.16 mmol) was added after the TEAL, polymerization run temperature was maintained at 32°C, ethylene was added continuously to increase total reactor pressure by 275psi before catalyst addition, and the run time was 15 minutes. A yield of 143.8g EP copolymer granules with bulk density = 0.398 g/cc was obtained. Catalyst Efficiency: 2.88Kg/g/hr, polymer composition: 66.4 wt% ethylene, Mw = 398,000, MWD = 2.90, and Mooney Viscosity (ML1+4, 125)= 106. (d) optionally prepolymerizing the catalyst with olefinic monomer. The method according to claim 1 wherein the olefinic monomer(s) are alpha olefins containing from 2 to 20 carbon atoms. The method of claim 1 further comprising prepolymerizing the supported catalyst with olefinic monomer, preferably with the prepolymer comprising 10% to 300%, especially 50% to 150% of the supported catalyst weight. The method according to Claim 1 wherein the metallocene component is a bis cyclopentadienyl derivative. The method according to Claim 1 wherein the metallocene component is rac-Me2Si(Ind-H4)2ZrCl2. The method according to Claim 1 wherein the metallocene component is rac-Me2Si(2-methyl-4-t-butylcyclopentadienyl)2ZrCl2. The method according to Claim 1 wherein the metallocene component is Ph2C(fluorenyl)(cyclopentadienyl)ZrCl2. The method according to Claim 1 wherein the metallocene component is i-Pr(fluorenyl)(cyclopentadienyl)ZrCl2. The method according to Claim 1 wherein the carrier is an inorganic support. The method according to Claim 1 wherein the carrier is silica containing less than 1 wt % loss on ignition. BE1005957A5 (en) 1992-06-05 1994-04-05 Solvay Preparation method of catalyst system, process (co) polymerization of olefins and (co) polymer at least one olefine. MX9605832A (en) * 1994-05-24 1998-05-31 Exxon Chemical Patents Inc Fibers and fabrics incorporating lower melting propylene polymers. MX2012007248A (en) * 2009-12-22 2012-07-30 Oxane Materials Inc A proppant having a glass-ceramic material. Inventor name: MURATA, MASAHIDE, TONEN CORP. R&D LAB.